We walked down the dirt path, no sounds except that of our footfall and the birds calling in the tree canopy high above us. The jungle was clearly master of the land here in Guatemala, and its untamed force was making its inexorable way toward once again taking over the path, and everything else around it. We came into a sudden clearing, where the sunlight fell more freely into the forest and there it was: the first of the Mayan pyramid ruins we would see that day. This was one of the smaller temples that had been excavated and was known as Temple VI. It was largely unearthed, with the steps revealed and cleared away only at one side. 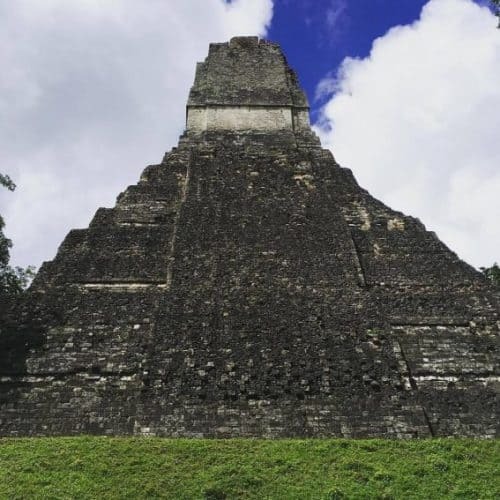 A climb to the top of those steps would yield the first views over the vast complex that was once the thriving, prosperous Mayan city of Tikal in northern Guatemala.